Google appears to have started a trend with its easy-to-use but pricey OnHub WiFi router. A startup company has Luma created a router with the similar goal of giving you easy-to-use wireless security, monitoring and device connections. It adds a new twist by letting you use several throughout your home in order to increase coverage to, say a corner office, similar to how Sonos WiFi speaker system works. The company calls it "surround WiFi," and each added device requires no additional setup -- the system updates and tunes the signals automatically in order to "always offer peak performance and speed," according to the company. 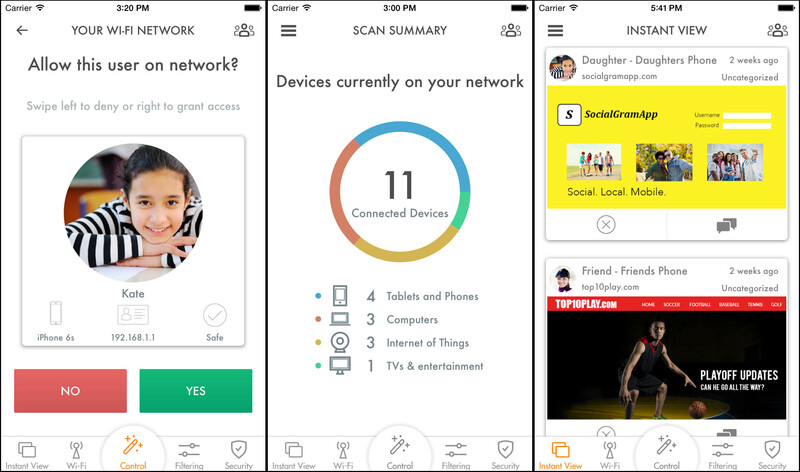 Luma also has "enterprise-grade" security and parental controls with device-level customization. All of that is controlled by a smartphone app that helps you quickly block unwanted users, connect devices without a password or set website ratings for your children, to name a few examples. You can also add timers to control how long your kids surf and monitor the total number of devices connected to your router, to name a few more features. There's even a feature that appears to let you monitor user browsing (below), which is actually a bit creepy. Each Luma has two dual-band radios on 2.4GHz and 5Ghz bands using 802.11ac Wave 2. Multiple devices work together to form a mesh WiFi network, a system that supposedly provides more speed than using repeaters. The product is clearly not aimed at someone who may want to hack the antenna signal, but rather at folks who are willing to pay for convenience and extra features. As such, the final pricing is pretty high -- it will run $249 for three devices ($99 per device) for the next 30 days, then climb to $199 per device and $499 for a three-pack. However, if you really need the simplicity and monitoring features, you now have another option besides Google. Pre-orders are open, and shipping will start in early 2016. Update: The pricing in the original post was incorrect and has been updated, and we've now included the Luma's wireless specs.